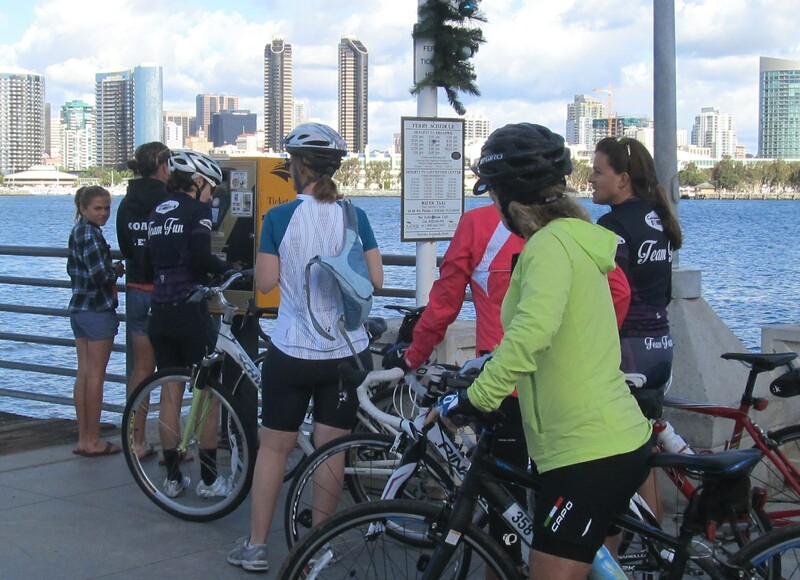 A relatively small group (seven riders) turn out for Saturday the 13th’s very flat ride to Coronado Island. It had rained quite heavily the night before and was still splashing away in the city as late as 7 am. 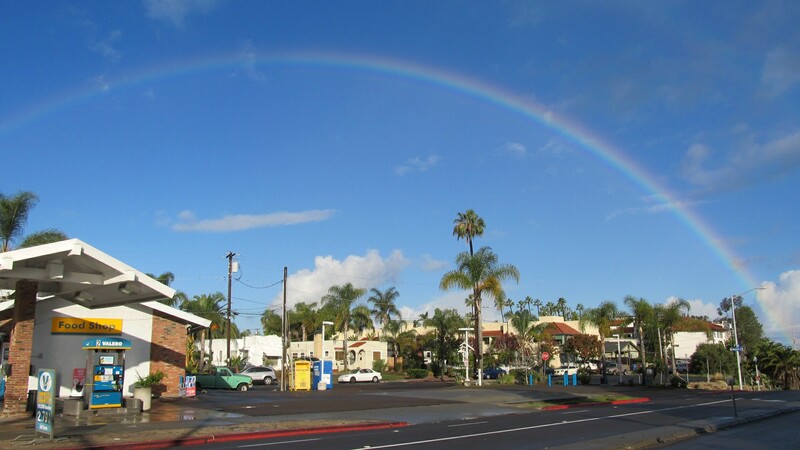 By the time the group met up at the parking lot off De Anza Rd on the northeast side of Mission Bay, however, the sky had cleared up and we were even treated to some really nice rainbow on our way in! The morning was so full of promises! Rolling south through Mission Bay. SDBC Holiday Toy Riders turning into Old Town. We would have followed the Santas, but Coronado was calling! We wondered how we had gain such stardom… until we were caught by a large peloton of Santas the Taylor St traffic light in Old Town. 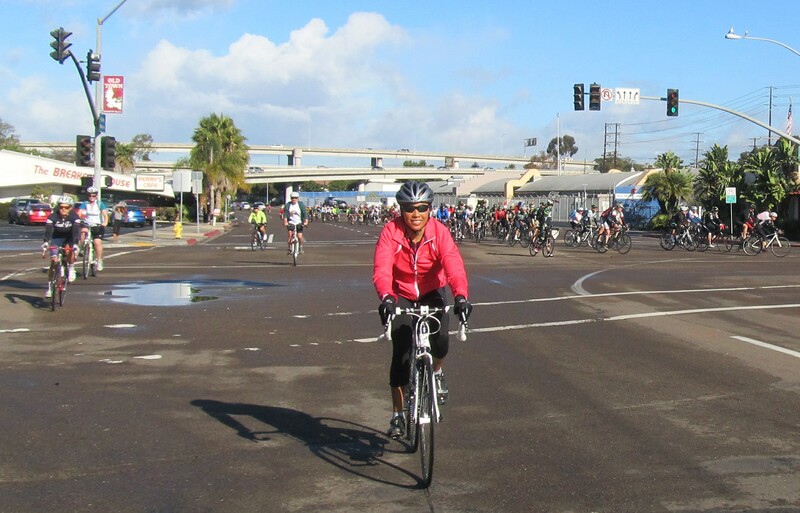 It was the San Diego Bicycle Club (SDBC)’s annual Holiday Toy Ride! The Santas (along with many elves) made the turn into Old Town on Taylor St, on their way to delivering the toys at Kroc Center in Redwood Village area. For all our hamming for the cameras, we weren’t the main draw after all! Escaping Downtown on the wet green bike lane on Harbor Dr.
Brielle, still sailing easy through the port. The group survived Downtown despite of my many attempts to veer us off the beaten path (not always into the most traffic-friendly detour, I should add)! Brielle somehow kept up with the lighter road bikes with apparent ease while Miki and Gretchen (both still very new to cycling) put in commendable efforts in the back. 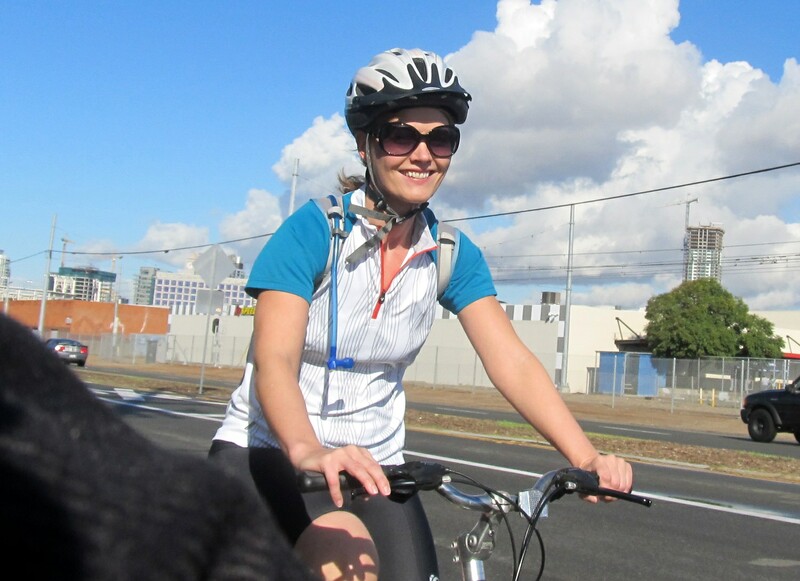 I don’t know what I would have done without Heather B & Heather K to keep us well herded as we made our way south to Bayshore Bikeway. 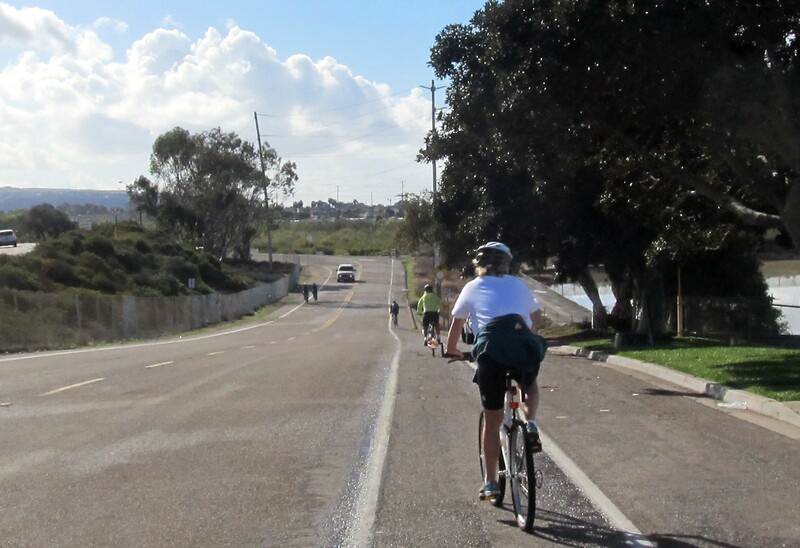 We did veer off the beaten path for a bit on Lagoon Dr/F St to skirt the shoreline along Chula Vista’s J St Pier & Marina. After all, it was a sight-seeing ride! 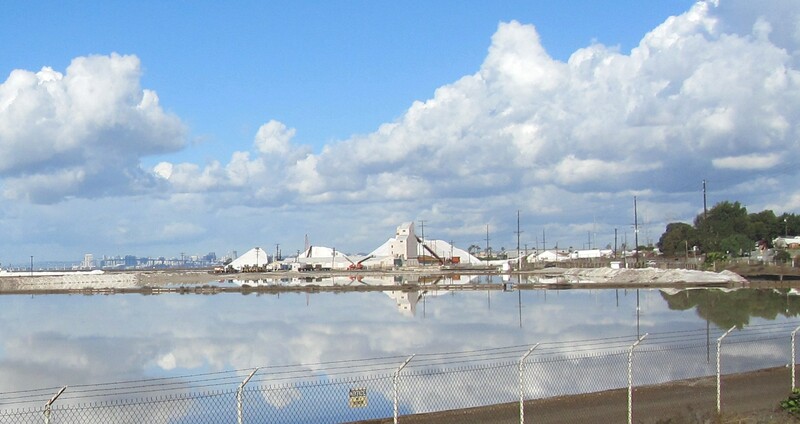 Check out how big the salt piles are! Gretchen & Miki in the South Bay. The salt farm, from across the bay. 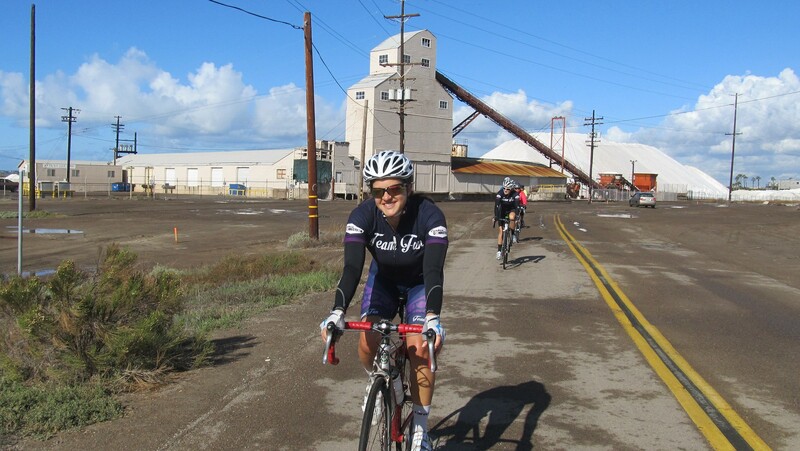 The South Bay salt farm has been working hard making mountains of salt piles, and our group stretched out a bit on the flat, windy and car-free Bayshore Bikeway through Imperial Beach and the Silverstrand. 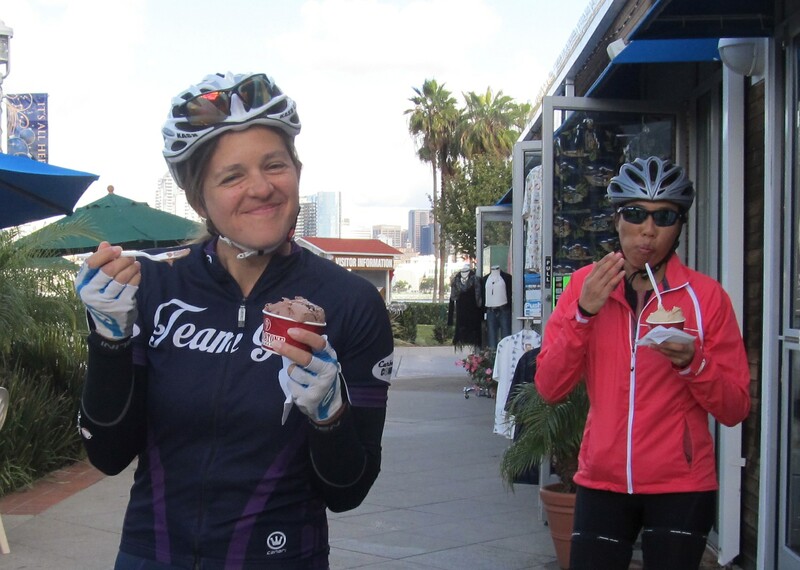 Everyone made it to the ferry landing in good time, though, and fueled up with some seriously high-octane/calorie stuff at Coldstone Cremery while waiting for our boat to arrive. Ice-cream is not cake, so you can both have and eat it, too! Coronado Ferry… is quite worth $4.25 per ride. The Heathers… still smiling after both Coronado and Mt Soledad. The home leg of the trip was quite thankfully uneventful. 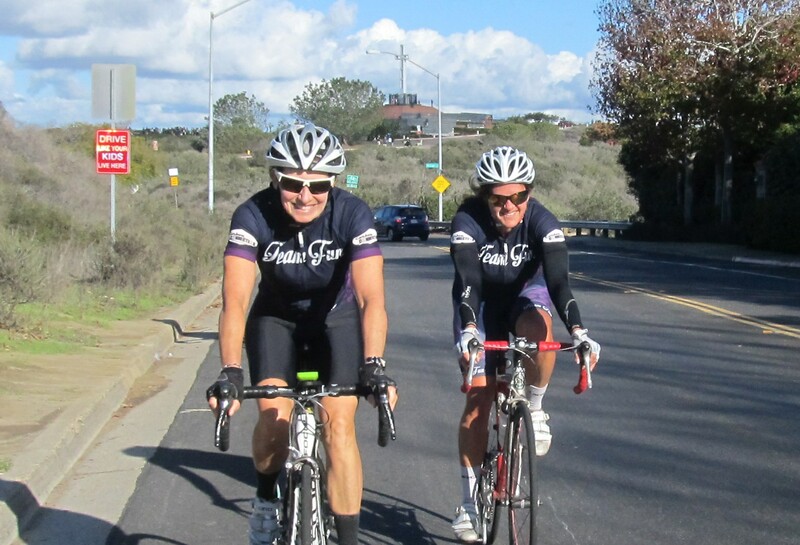 Congratulations to Miki and Gretchen for completing their longest ride yet! 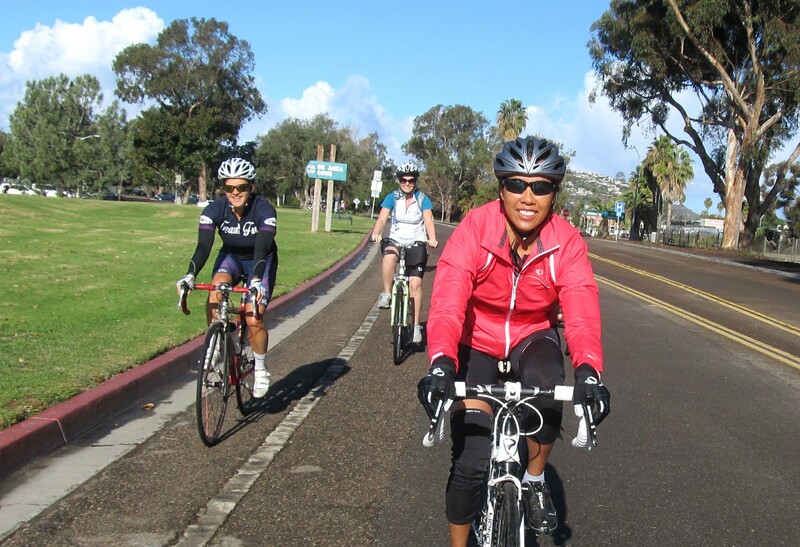 The day was still relatively young and the air crisp for the road bikers, however, so the Heathers, Janice and me decided to add a climb up to Mt Soledad Memorial Cross (by Soledad Mountain Rd) before calling it a day. It was another perfect Saturday morning on the bike… that was until we got home and realized how much a bike wash was needed, of course! Beach Path into San Clemente. We wish you all a very Merry Christmas and Happy Holiday! 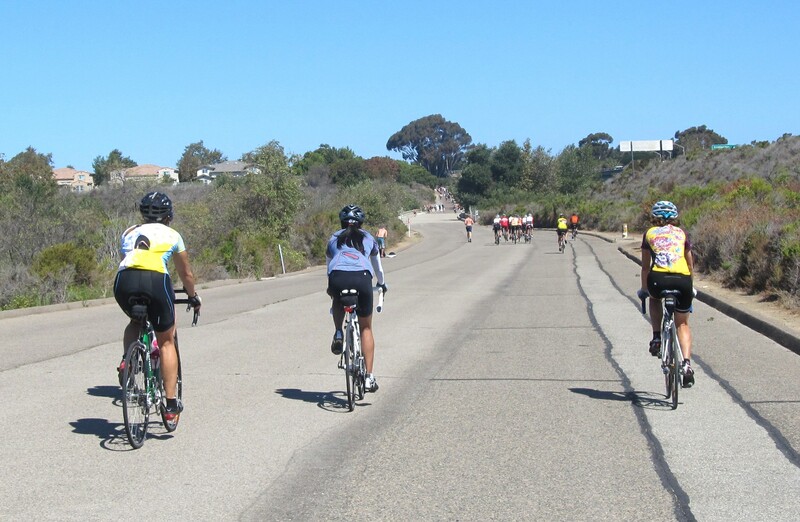 Come and join us on Saturday December 27th to burn off all the seasonal goodies on a moderately flat but scenic ride north through Camp Pendleton to visit San Clemente’s Bagel Shack. 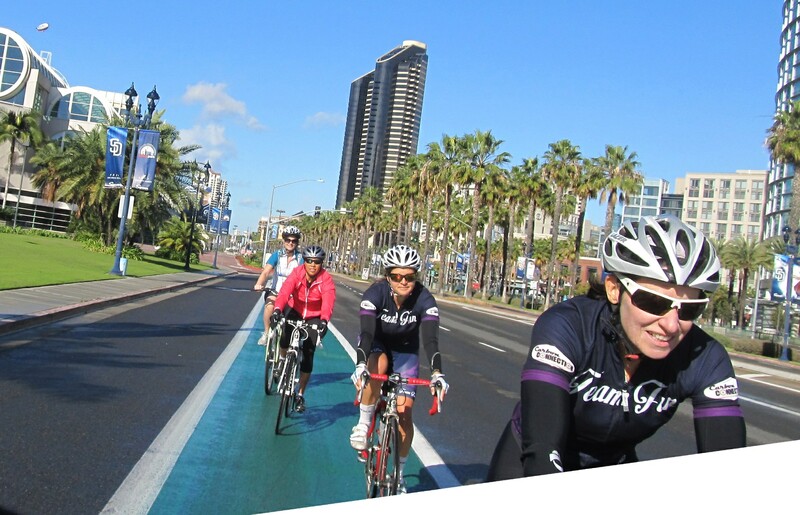 We will be starting from Carbon Connection Cyclery at 8 a.m..
← Cabrillo Mellow Sightseeing Ride… Really!